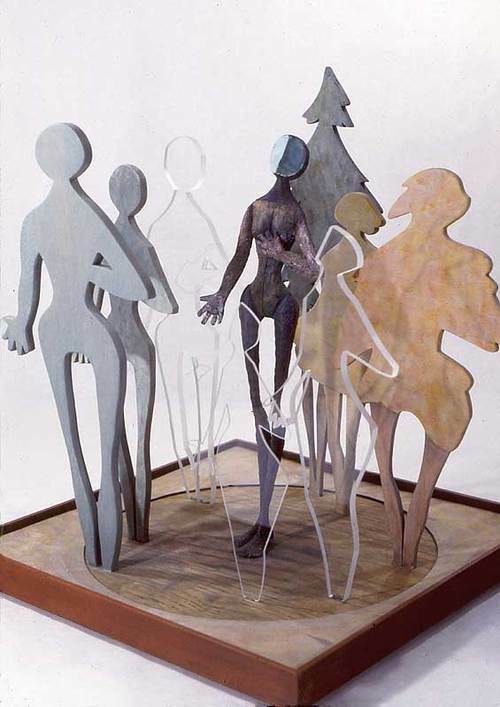 Painted bronze and wood, and plastic, last revision 1991, 18" x 18" x 21". Messenger was a piece that demanded to be made, but once it was, it unsettled me. I avoided it. Of all my pieces, this bronze figure was the only one that I could not crawl inside of. For years I wondered if I was one of the shadows. My mother claims I was not born shy, but became shy because I was born with a cataract in one eye. It was diagnosed and removed when I was four, a second surgery followed six months later. At five, doctors began trying to force the eye to see by patching my good eye, starting with three hours a day, gradually stretching it to three weeks with patching, three weeks without. Like the glasses perched on my nose, permanently askew from the pairing of a coke bottle lens and a plano lens, my life teetered out of balance between the life of a normal active child and that of a dependent, legally-blind child. In second grade efforts to salvage the eye ended, but repeated, prolonged colds led to a tonsillectomy. In third grade, I was back in glasses for my near-sighted good eye; a bad fall necessitated another round of doctors and tests to rule out epilepsy; and I had a final eye surgery. From sixth to ninth grade, alarmed by my accelerating near-sightedness, my doctor prescribed daily eye drops to dilate the pupil and a bifocal lens. Once more the mirror reflected mismatched eyes and glasses. Slowly but surely, with each surgery, doctor visit and eye drop, I retreated, becoming increasingly shy and unsure. But in eighth grade, I impulsively ran for student body president. I wrote my speech with the help of my English teacher, in secrecy, in case I chickened out. The speech was carefully crafted with humor and a clear message - that while it had never happened in the history of Glenwood Springs Junior High, girls were just as capable as boys to serve as student body president. It was 1965, I had no chance of winning, but I was ecstatic. I felt triumphant - my words had connected, triggering nods of agreement, claps, and laughter in all the right places. As I left the stage, a boy shouldered his way through the crowd; his mouth twisted in rage, spewing expletives; his fist raised to strike, before someone stepped between us, shoving him back into the crowd. Inexplicable bits of memory of the words and euphoria lingered; memories of running for a school office and the boy vanished forever into a black hole in my brain. After my high school 20th class reunion, close friends gathered. We found ourselves talking about our greatest fears, wondering why. One friend spoke of her fear of flying, another of her fear of heights. I spoke of my predictable fear of doctors in white coats and hospital smells, but also of panic attacks that seemed to be triggered by words. I tried to describe the sudden, deep fear that would descend hitting a shut-off valve - clamping my throat shut, freezing my thoughts, in the middle of casual conversations, meetings, and family celebrations. Most episodes passed quickly, but some reverberated through my life for days, weeks. I spoke of my growing distrust of words and how I chose my words carefully, avoiding words of substance or reducing them into crisp, blunt statements that could be voiced quickly, before the silence took hold. I confessed to "forgetting" events and other ruses, to avoid or mask times words refused to flow. My best friend laughed, declaring, "finally one we can solve." She went on to recounted that lost day from eighth grade, surprised I could not remember giving the speech or its impact. Initially I dismissed her theory that an adolescent "angry white male's" reaction to a forgotten speech was the source of the terrors. But later, after children and community causes propelled me back into the world escalating the frequency and severity of the episodes, I began to analyze them and read about the brain. It is my amygdala, my survival brain, which watches over me, sending out red alert warnings of impending doom when attention turns to me and I open my mouth to speak. If my words are of facts and figures, my rising fear can quickly be doused, but if I speak from the heart, about beliefs and passions, the fear swells, threatening to swallow every word. Other events, as I came of age in a patriarchal world, fueled and intensified my amygdala's diligence, but I learned to work behind the scenes or in solitude, to speak through sculpture or give my ideas to others. I muzzle my opinions or voice them, depending on whether they are worth fighting through the fear. I still struggle with Messenger. She shouts her message with a confidence and boldness that is so very foreign to me. It is clear that her words do not dam up in her throat to wither and die unspoken. I finally understand that Messenger is not me as I am, but me as I am not. She is a bitter sweet reflection of who I might have been; who I was for one brief exhilarating moment between shyness and fear; and she is who I still long to be.